Calling for a day of memory for victims of honour-based violence. Karma Nirvana, a charity that supports victims and survivors of forced marriage and honour-based abuse, partnered with Cosmopolitan, the world’s largest women’s magazine brand, earlier this year, to lobby Theresa May MP. They are asking May to establish a day of memory for all the women killed in what is known as ‘honour-based violence’ (HBV). The day of memory being proposed is 14 July, the birthday of Shafilea Ahmed – who lost her life in 2003. After suffering years of honour-based violence, including an attempted forced marriage, which saw her parents drug and fly Shafilea to Pakistan, she was suffocated to death – by her parents – in front of her siblings. The parents were initially arrested but then released without charge in 2004; it took almost nine years for her parents to finally be found guilty of her murder and sentenced to life imprisonment. Although this summer forced marriage will become illegal in England and Wales and punishable by up to seven years in prison, thousands of women are still being beaten, abused and raped as part of ‘honour-based’ violence. For some, on a daily basis. The UK government’s own Forced Marriage Unit (FMU) dealt with 1,302 possible cases of forced marriage last year – more than 80 per cent of them involving female victims. Karma Nirvana’s helpline is currently getting an average of 700 calls a month, a 21 per cent increase from last year, when the average was 550. But the hidden and secret nature of forced marriage means any public figures are merely the tip of the iceberg. 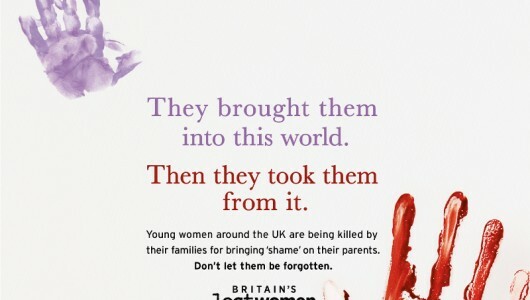 Cosmopolitan and Karma Nirvana are therefore urging everyone to call for an official day on which to remember all the women who have lost their lives to honour-based violence, to break the silence, and raise awareness of the cruelty that is still happening in Britain today. Jasvinder Sanghera CBE, a survivor of forced marriage and founder and chief executive of Karma Nirvana, hopes a memorial day will encourage victims of honour-based violence to speak out. “Girls and women can be murdered for the most basic freedoms – the right to education, independence or wanting to choose their partner,” she told the Huffington Post. “A day of memory will honour these women and dishonour the crime. Cosmopolitan also ran a limited edition February cover that was distributed when The Henry Jackson Society launched their report, Honour Killings in the UK, at an event held in the Houses of Parliament on 14 January. The report explores how the UK government is continuing to let down thousands of victims; on-the-ground efforts by campaigners are not being matched by the government, which needs to take the lead, not only in dealing with cases effectively, but in preventing them from occurring in the first place. It also outlines the scale and nature of the problem and the risks victims seeking help face and challenges in raising awareness. Relatives often actively attempt to find family members who have run away. There is currently a terrible lack of awareness and absence of willingness to cooperate in our schools. This prevents teachers from: firstly, being able to help prevent HBV through education; but also to identify and protect victims of HBV. Women’s support groups for victims of forced marriage and HBV currently provide a unique service in the UK. Yet, despite filling a shocking gap in public services, they do not receive any adequate or long-term financial support from the government. “Until the government starts taking HBV seriously with real, immediate action, the rights and hopes of British girls and women will continue to be denied,” Dyer said. “This change needs to be centred around raising awareness among professionals that regularly come into contact with potential victims and perpetrators, from schools to the police. If you or someone you know needs help, contact the Forced Marriage Unit or Karma Nirvana on 0800 5999 247. Dial 999 if it is an emergency.